The Yukon will get a total of just over $360 million in federal and territorial funding to improve road access to two mineral-rich areas, Prime Minister Justin Trudeau and Yukon Premier Sandy Silver announced today. ... More than 650 kilometres of road will be built along with other infrastructure for the Yukon Resource Gateway Project. 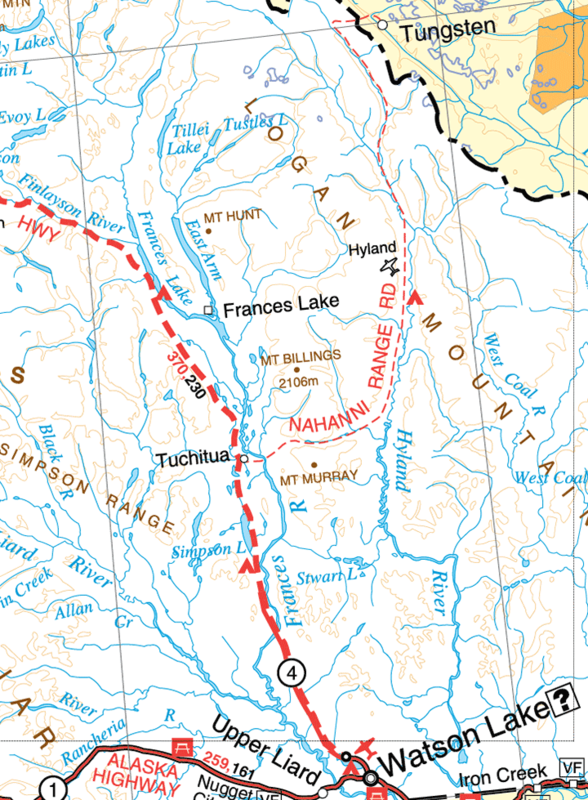 In the Dawson Range, four separate public road systems will be upgraded and the Nahanni Range road will be upgraded from its junction with the Campbell Highway to the border between Yukon and the Northwest Territories. I had thought YT 10 was a prime candidate for decommissioning, especially with the route officially not recommended for tourist travel. Probably still a barrier is that, unless arrangements are made with the mine operator in Tungsten, travelers face a 410-mile round trip with no opportunity to refuel, since there are no gas stations on YT 10, and the nearest gas stations are in Watson Lake YT. (Both the unpaved surface and mountainous terrain would hurt fuel mileage.) It wouldn't surprise me if the Tungsten mine operator has only diesel fuel, for the mine's own use. While I had two 25-liter containers to carry extra fuel (which I had used on the 288-mile trip from Ross River YT to the NWT border and back on YT 6), I didn't think that would let me travel all of YT 10, and I was running short on time in any case, so I turned around at Dolly Varden Creek about 25 miles from YT 4.